Orly Genger’s newest site-specific installation, You, will transform Brown University’s Front Campus from November 2014 through June 2015. 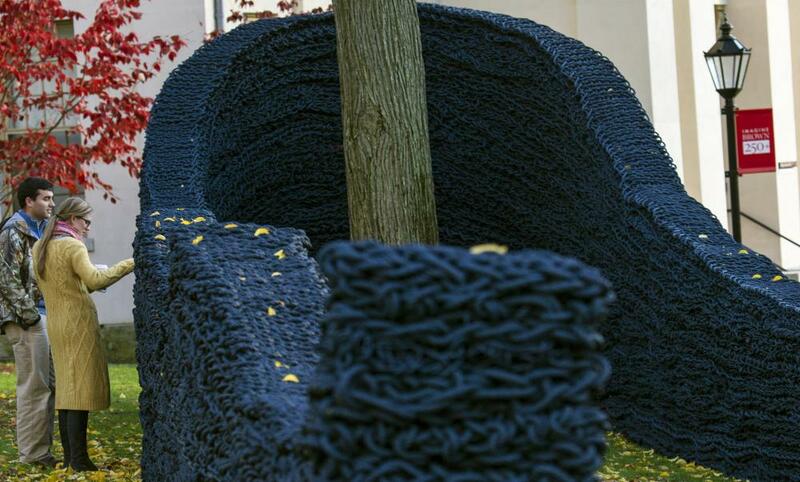 Genger, who graduated from Brown in 2001, is widely known for her massive sculptures made of hand-knotted and painted recycled lobster rope. She creates meandering interruptions in landscapes both natural and planned. Genger plays with conceptions of femininity through her intimate working process—knotting and weaving typically comprise “women’s work”; by monumentalizing this practice, Genger takes “women’s work” out of the domestic sphere and into the public. In doing so, she reframes the type of large-scale sculpture associated with renowned male Minimalists—such as Richard Serra and Donald Judd—using aspects of their formal language to build tactile, playful, and inviting public installations. Genger’s installations, cast sculptures, and drawings have been featured in a wide array of spaces, from the 2010 Brucennial to MASS MoCA to Madison Square Park.